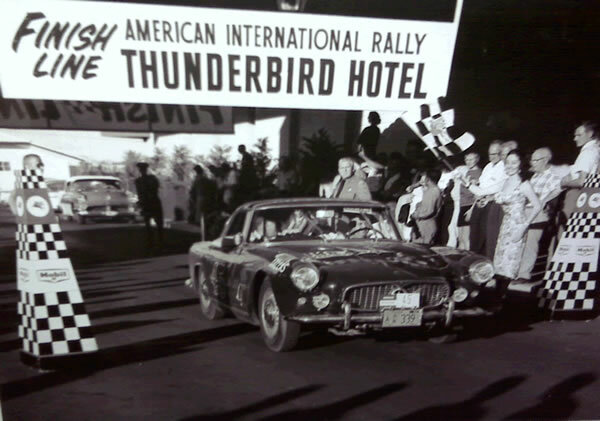 This site is dedicated to the Maserati 3500 GT Touring, the first production car of Maserati. The prototype (101-001) was shown on the 1957 Geneva car show. Production of the 3500 GT(I) took place from late 1957 until 1964. 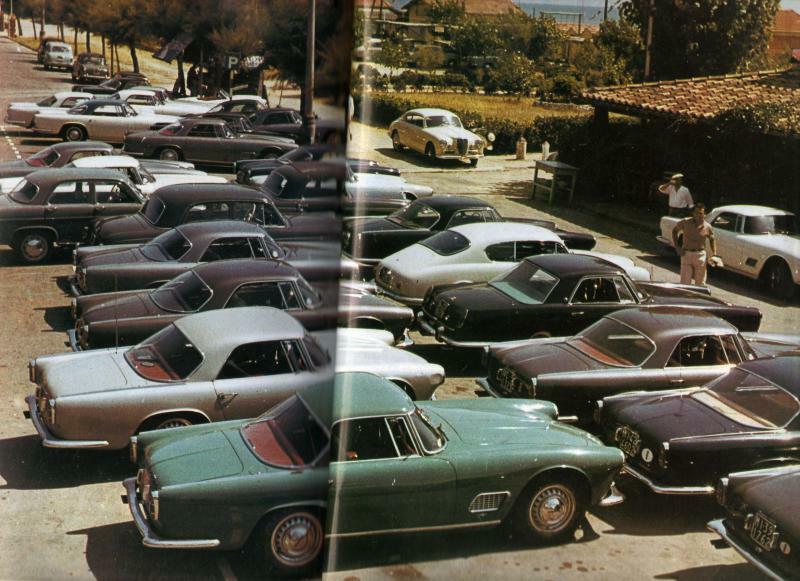 1402 cars were built by Touring, according to Fabio Collina of Maserati Classiche. This site tries to register as much as possible known facts about them, no matter if they still exist today or are known to be scrapped. 717 cars with VIN plus 90 cars with 'VIN yet Unknown' in database! The cars are sorted on VIN. Click in the left menu on a range for a car-VIN of your interest or help us identifying the 'VIN yet Unknowns'. 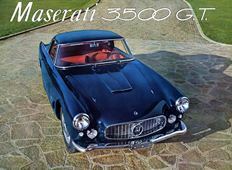 Much of the information is coming from Maserati 3500 enthousiasts like myself. If you happen to have information about these cars please let me know! Note: Quite some pictures and information is coming from the internet. If you have problems with some information, please let me know and we'll talk about it. Updated: 101-2506 (picture and/or text). Periodic picture of more then 20 Touring bodied 3500's together in Forte dei Marmi. Probably taken early 1959. Maybe your 3500 is out there! Picture provided by Corrado Bellabarba. 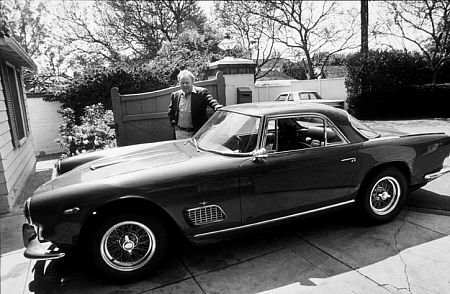 Carroll O'Connor with his 1962 Maserati 3500 at home in Los Angeles, CA, circa 1974. A picture from Bob Allinger (Allinger and Adams Racing) in 101-318, probably late 1950's. The car has the same registration as in the Road and Track test. One carefull astronaut owner? 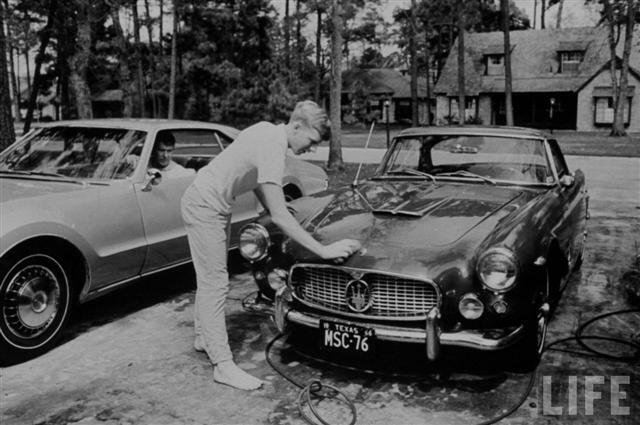 Astronaut Walter M. Schirra's son cleaning his father's car. Unknown 150. Picture sent to me by Andrea Montalenti. Appeared in Time magazine and was made in 1967 by Ralph Morse. Life can be hard on your 3500, specially on 101-1334. The picture above were made by Staffan Gunnarsson in 1978 while he was in Italy. The scrap yard is in the Milan area. The car was lying between two other cars, and the owner used the crane you see in the background to lift it with. This scrap yard was specialised in scrapping sports cars and there you could find several Maserati's, Ferrari's and Lamborghini's. Staffan loaded his Volvo estate car with all the usable parts.